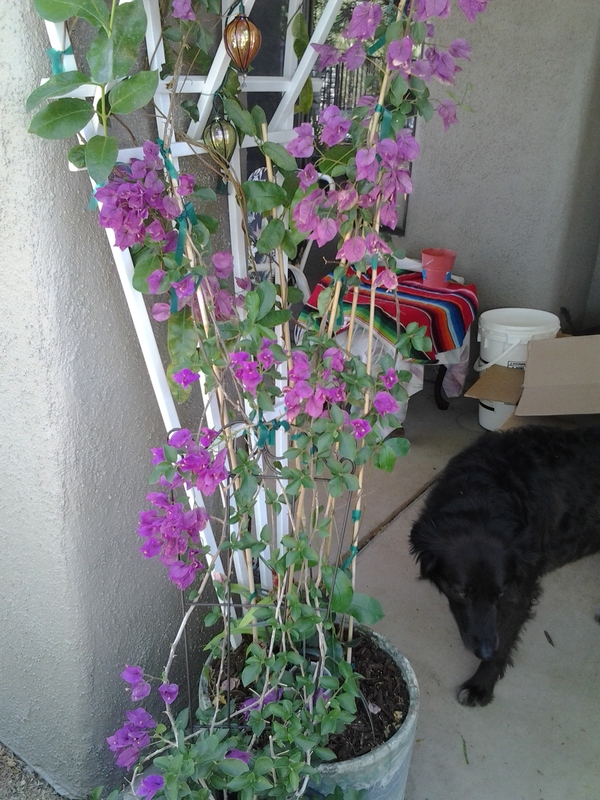 Bougainvillea can take the Arizona heat! Bougainvilleas are tropical plants that thrive in outdoor areas with low rainfall and intense heat, someone say desert! They need lots of sun and are happy with Arizona temperatures reaching over 100 degrees. They have thin roots that are somewhat delicate and we find our Bougainvilleas take more of our attention in the garden. My conclusion and my gardening experience with Bougainvilleas is that they are happier growing in large pots with good drainage. In this picture above, the stem looks bare because I recently removed the dead leaves and new blooms are just arriving. The Bougainvillea loves this planter and will fill out in no time! The amount of watering needed for your bougainvillea is directly related to your area and the local weather. There are some basics – Bougainvillea is a drought resistant plant, and requires very little water once established and mature. Let the soil dry between waterings; if your Bougainvillea’s roots stay continuously wet it will promote a weak and shallow root system. Wilting is the best indicator that watering is needed. Don’t let it dry out completely as this will cause bracts and foliage to drop. For Bougainvilleas planted in the ground: At the time of watering, do it thoroughly – making sure that every inch of root gets watered! I use long bamboo garden stakes to measure how far down the watering has reached and I soak until it reaches 8 inches. This will create a stronger root system for your bougainvillea. Deep watering is the key! In Florida, landscape professionals commonly perform a hard cut at the first sign of summer, and keep on a regular trimming schedule all summer long to maintain size. Pinching is the method of removing the soft tips of young plant stems to encourage fuller growth. This hardy plant will send out several new stems just below the pinched tip. I am going to prune/pinch all 6 of our Bougainvilleas this week. My Arizona Garden keeps me busy, and I love it! The more regularly you pinch, the more your bougainvillea will branch and bloom. The best time to prune or pinch is after the flush of color or flowering cycle is completed. Flowering cycles are typically four to six weeks. Lets get pinching! Author tjsgardenPosted on July 7, 2017 July 7, 2017 Categories Bougainvillea, Desert Plants, Drought Resistant, Flowers, Hardy Plants, Heat Resistant Plants, Perennials, Unique Garden Items, VinesTags bougainvillea, bougainvillea on a trellis, bougainvillea takes the heat, bougainvillea vine, bougainvilleas in a pot, Desert Flower, Desert Garden Plant, Drought Resistant, grow bougainvillea in container, Heat Resistant Plants, TrellisLeave a comment on Bougainvillea can take the Arizona heat! Honeysuckles love the Arizona heat and the hummingbirds love the honeysuckle. Now that is a desert garden delight! As long as I water this thirsty honeysuckle shrub it will produce abundant blooms most of the year. 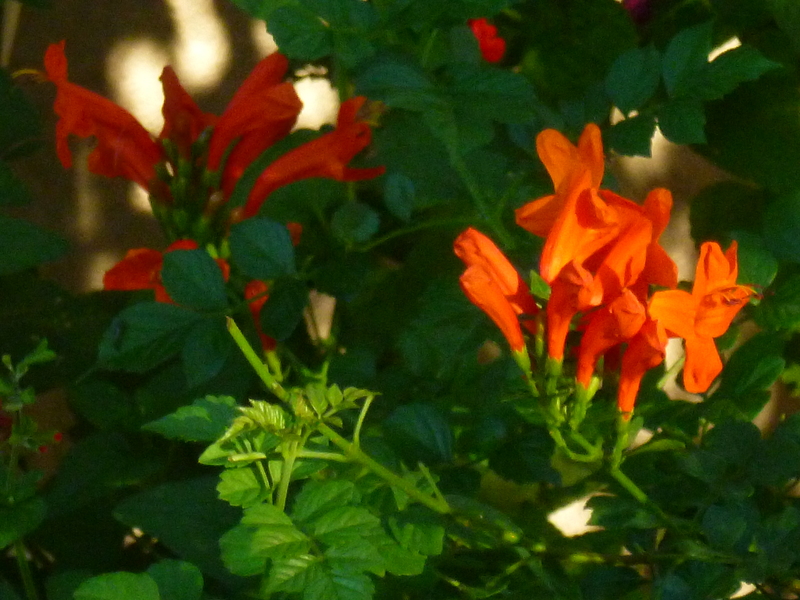 The narrow, orange, tubular flowers give enthusiasm to the garden with their bright colors. 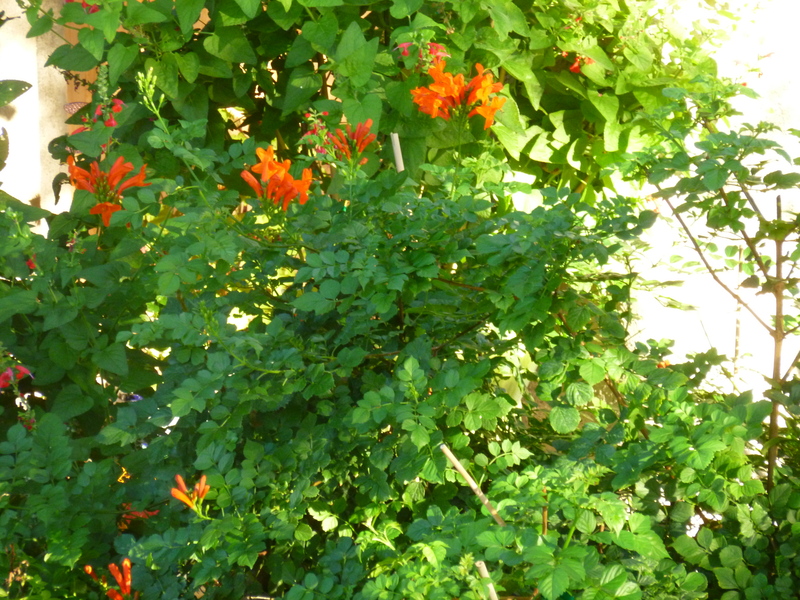 Our orange honeysuckles are fast growing perennial plants that are low maintenance. Care for your honeysuckle with regular watering and pruning to keep the growth under control. 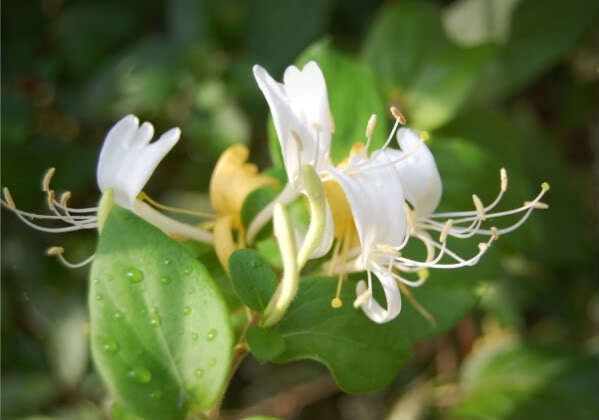 With 180 species of honeysuckles, genus Lonicera, you can pick from pink, yellow, white, orange, red, etc., flowers. Honeysuckles belong to the Caprifoliacea family which includes all types of woody shrubs and fragrant vines. When choosing a honeysuckle to grow, be sure to check the label as some varieties are hardier than others and can cope with frost. Also, there exists a few species of honeysuckle that are considered invasive such as Japanese honeysuckle. Pruning tips for honeysuckle vines: Prune your plant in later winter when it is dormant. 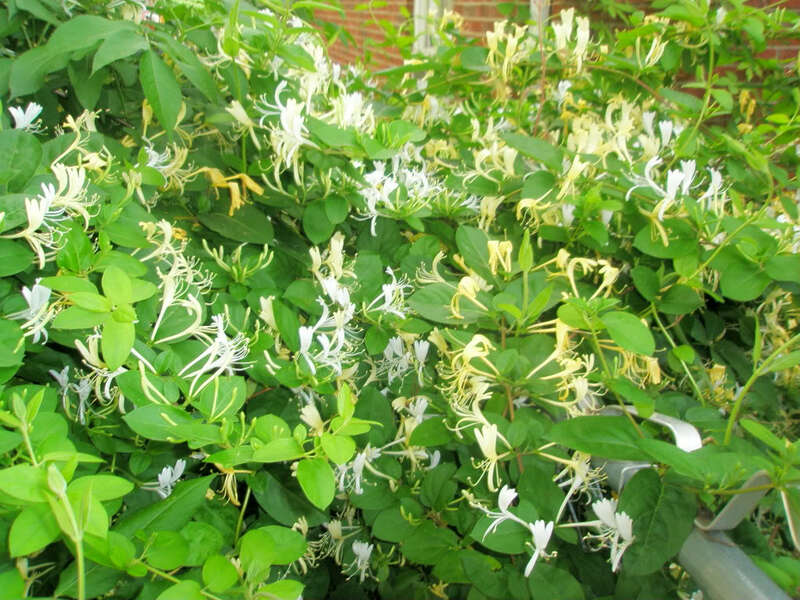 With pruning shears, remove dead blooms from your honeysuckle as soon as you see them. Tree, fence, trellis or wall; honeysuckle vines will climb on anything to seek out the sun. Our garden has become a very busy place. It is October in the Arizona desert and our honeysuckles are still blooming. 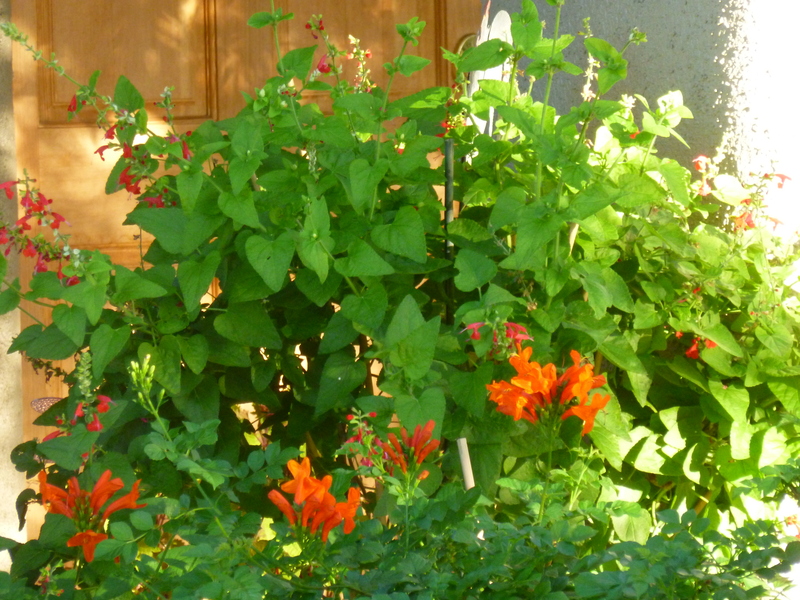 What a joy to sit quietly and watch the butterflies and hummingbirds feast on the bright tubular flowers. These heat tolerant honeysuckle plants did well even in full desert sun as long as they received their daily water. In the photo above is Lonicera arizonica which is a native Arizona Honeysuckle. It is a perennial vine or shrub that you find in the open at elevations of 6,000 – 9,000 feet. 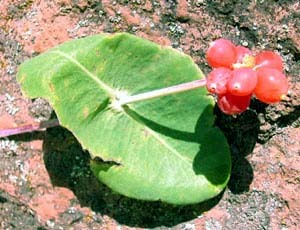 According to Northern Arizona University, this native honeysuckle was used by Native Americans to cleanse the bowels. Navajo tribes used the leaves of the Lonicera arizonica to induce vomiting. Can I eat the red berries from the Arizona honeysuckle? Yes you can eat the berries but it will have a purgative effect. The MANDEVILLA vine is growing well. This Mandevilla plant is native to Central and South America – named after Henry Mandeville (1773-1861), a British diplomat and gardener. Mandevilla, also known as Brazilian jasmine, Dipladenia, is a flowering tropical plant that originated in the hills above Rio de Janeiro. Mandevillas develop spectacular flowers in warm climates. They are perfect here in the hot desert Arizona garden. One of our secrets for cultivating this luscious pink variety (they come in white, red and yellow) is the part shade design. **We purchased the 4 trellises from Home Depot, bent them slightly to fit the arch and then screwed them together. An important part of Mandevilla care is the light it receives. The Mandevilla vines need some shade. We used 4 large plastic garden trellises by the front door as you can see in the photo. Mandevilla plants love bright indirect or filtered sunlight, but will get burned in full sun especially this Arizona sun. Mandevillas are a vine and will need some type of support, we used garden ties and tape to help train it along the trellis. Some say the Mandevilla Vine is not a Perennial plant because it will NOT survive if temperatures reach below 50 degrees. BUT this past winter Southern Arizona reached down to the 30’s and as you can see this beautiful plant is thriving and full of pink flowers. Mandevillas have brought tropical flair to our Arizona front yard and desert garden. Mandevilla plants are critter proof – squirrels and packrats leave this plant alone! There are over 100 species of Mandevilla plants. The blooms start out as a lighter color and get darker as they age. Grow your Bougainvillea Plant in containers and pots. They LOVE IT !! Will my Bougainvillea plant grow in a container? Yes and it will be a very happy plant. Bougainvilleas do great in most types of pots and containers. These plants are not easy to transplant so make sure the pot you choose is big enough to last the Bougainvillea for years to come. Although they like their roots crowded in a container, Bougainvilleas do not like standing water. Make sure your pot has good drainage so the Bougainvillea does not get root rot. Fill your container with potting soil and place the bougainvillea plant inside. Find a sunny location and it will be easy to keep your Bougainvillea happy and healthy. Bougainvilleas have beautiful red, pink and purple colored bracts, which are specialized leaves that contain the plant’s white slender flowers. Bougainvillea plants can grow rather large so they must be kept pruned in pots and containers. You can train your Bougainvillea to grow up a trellis or in the shape of a tree. During the winter, Bougainvillea plants can be most striking and provide gardens with abundant color. Winter is when Bougainvillea Vines and Plants reach their peak color. The small heart shaped bracts of the Bougainvillea are quite delicate to the touch, and are crinkly in appearance. How long will a Bougainvillea plant display their color? The length of time depends on how much sun and heat it receives and how healthy the Bougainvillea plant is. Typically, a healthy Bougainvillea will bloom for about 3 weeks. Bougainvilleas love sun and more sun. They are heat tolerant and the hotter the better. At the very minimum Bougainvilleas need at least 5 hours of direct sunlight. 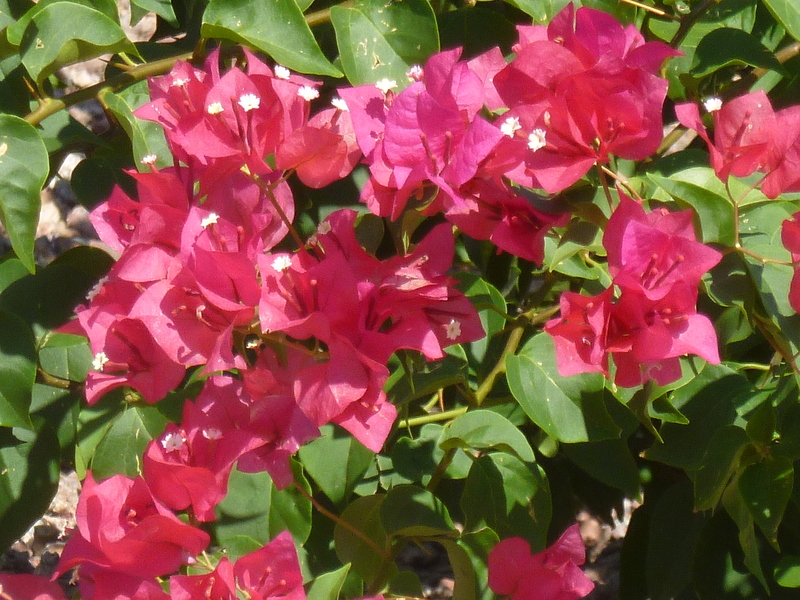 Supply your Bougainvillea with regular monthly fertilization. Nitrogen and phosphates are critical to flowering. One of the best Bougainvillea fertilizers I’ve come across so far is BOUGAIN. You can prune your Bougainvillea any time during the year because it does not affect bloom initiation. If you want the Bougainvillea to grow up, then prune the outer branches. If you want your Bougainvillea to grow out, then prune the new growth. Trim your Bougainvillea drastically before bringing it inside for winter. Bougainvillea plants and vines have a BLOOM CYCLE followed by a rest cycle whether you trim them or not. I recommend a little trim or pinching at the end of each Bougainvillea bloom cycle as it promotes more budding for the next one. Our plants just ended a bloom cycle so I will be trimming Bougainvilleas this week. Author tjsgardenPosted on March 30, 2014 April 22, 2014 Categories Bougainvillea, Bougainvillea, Bougainvillea, Desert Plants, Drought Resistant, Drought Tolerant, Flowering Desert Shrub Bush, Flowers, Free Pictures, Hardy Plants, Heat Resistant Plants, Perennials, Top 10 Heat Resistant Plants, Unique Garden Items, Vines, Xeriscape, DesertscapeTags arizona desert plant, Arizona Garden, best heat resistant plant, Bloom cycle, blooming desert plants, bougainvillea, bougainvillea blooming, bougainvillea in a pot, bougainvillea on a trellis, bougainvillea takes the heat, bougainvillea with no flowers, bush with magenta flowers, bushes along highway, desert bushes, Desert Flower, Desert Garden Plant, Drought Resistant, Free Pictures, grow a bougainvillea, grow bougainvillea in container, magenta flowers shrub, no blooms on bougainvillea, Phoenix flowering plant, prune a bougainvillea, top 10 heat resistant desert plants, tucson flowering bushes, water a bougainvillea, xeriscapeLeave a comment on Grow your Bougainvillea Plant in containers and pots. They LOVE IT !! Philodendrons are native to the tropical Americas and are a rain forest plant. With close to 1,000 species of philodendrons you have many choices of the best foliage plants available today. Heat resistant, oh yes! Philodendrons do amazing in southern Arizona even with temperatures reaching over 110 degrees. One of the best houseplants that adds a delight to any room is the philodendron. You can choose from a climbing or non-climbing variety. Our Elephant Ear, philodendron bipinnatifidums, are growing in pots and containers but in the spring I will be planting several in soil next to trees that have regular irrigation. Philodendrons like water because they are a species of the rain forest. 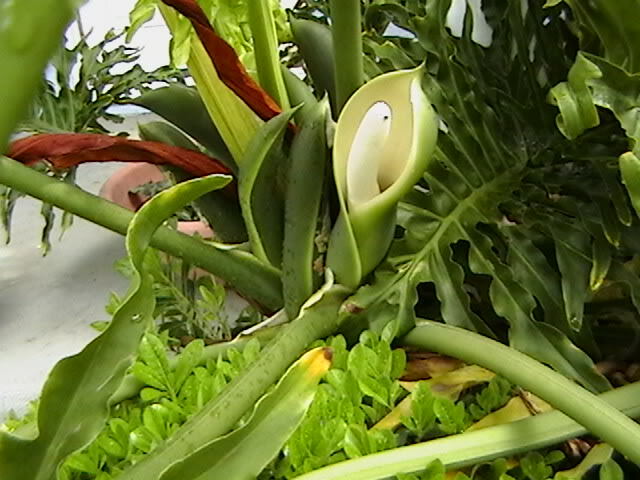 The genus Philodendron is in the family Araceae with each species having its own leaf size, color or shape that gives it a unique personality. 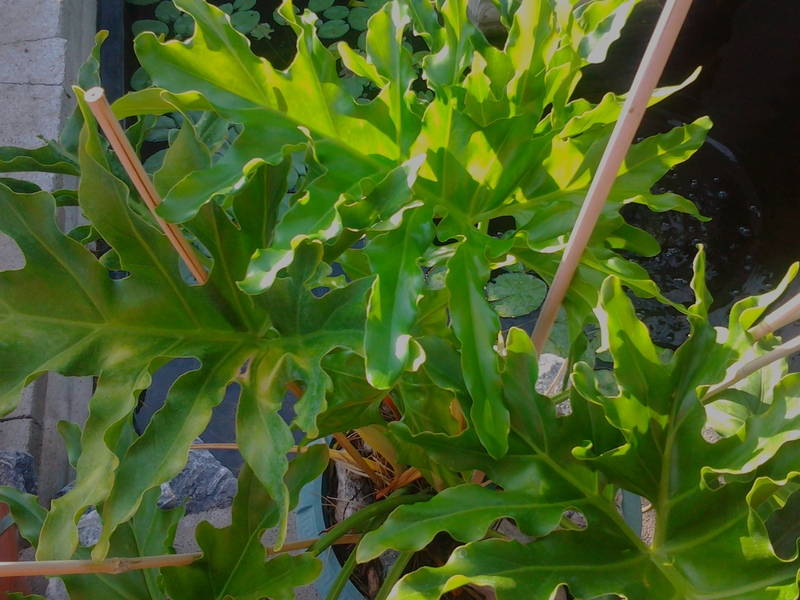 Propagating from climbing philodendrons is quite easy. Simply gather a stem cutting and place it in a glass of water. 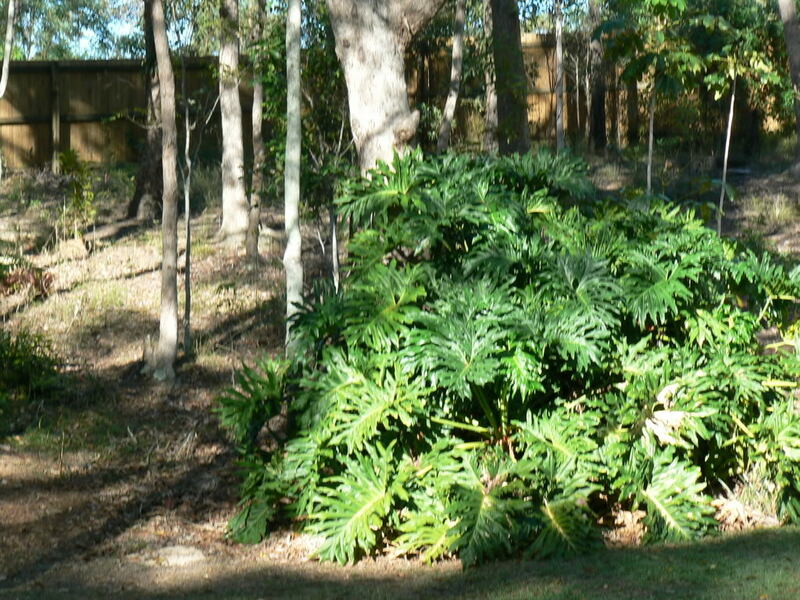 In the rain forest, most Philodendron species live on the trunks or branches of trees and do not need soil to survive. Those tree-dwelling species are known as epiphytes or hemiepiphytes and are plants that live upon another plant. 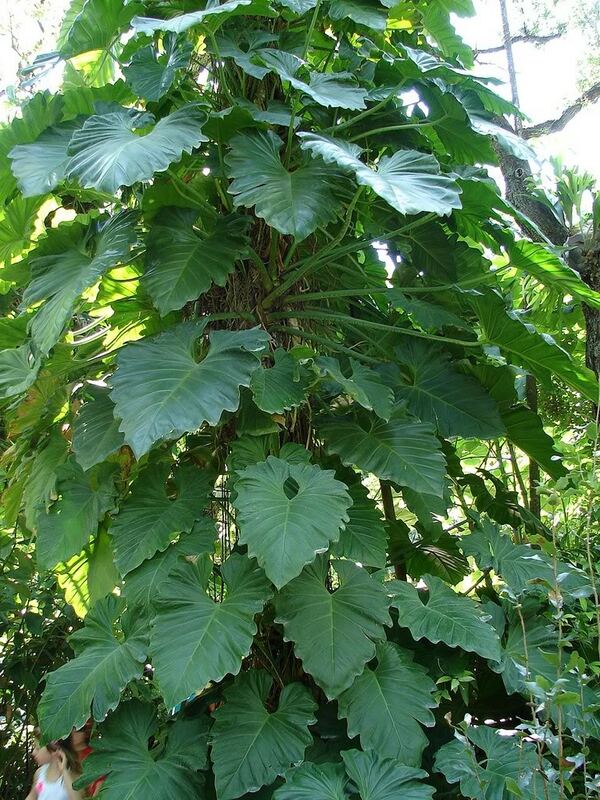 The Tree Philodendrons are found largely in Brazil, Argentina, Bolivia and Paraguay. Try not to plant your philodendrons in too large of a container. They actually grow better when their roots are slightly cramped. Re-pot your philodendron when the roots begin to compact into a ball. Philodendron bipinnatifidum, Elephant Ear philodendron, does produce flowers but it can take more than 10 years… Flowers are rarely produced on philodendrons that are grown indoors. To keep your philodendron clean; mist the leaves every few days. Misting is another way to make this tropical plant feel like it is in the jungle. 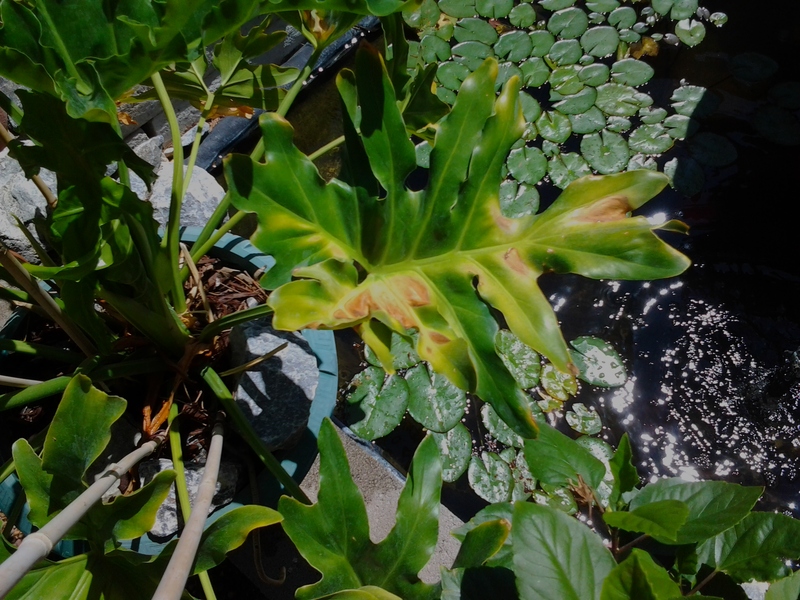 The leaves on my philodendron bipinnatifidum started turning yellow and brown. Originally, I placed this plant in too much direct sunlight. 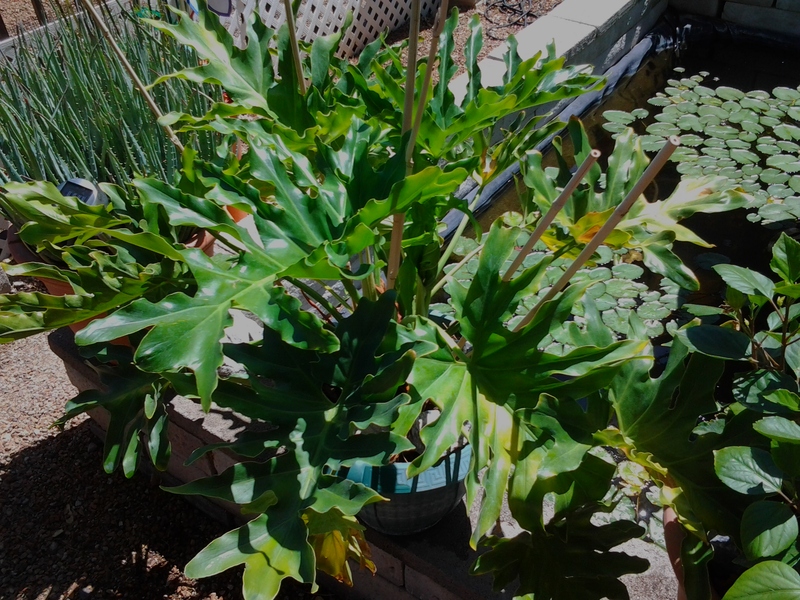 After trimming the yellowing leaves the philodendron was moved to a partly shaded area where it could not be burned by our Arizona sun. I can safely say this philodendron plant has no insect problems. If you are looking for a low maintenance plant that has large green leaves and gives a tropical feel to your garden… Elephant Ear philodendrons may be the right choice for you. Bougainvillea are tropical plants that thrive in outdoor areas with low rainfall and intense heat. The 100 degree temperatures do not faze our Bougainvillea. 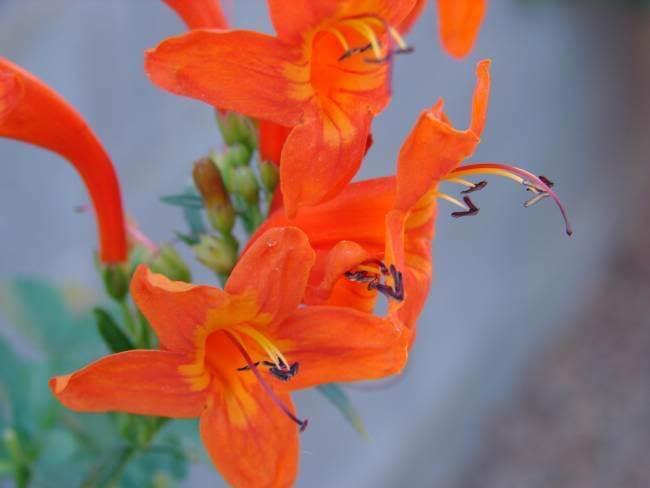 This flowering jewel is number 10 on our list of the BEST heat-resistant plants in Arizona. Bougainvilleas are native to South America; therefore, it is drought resistant (instead of “drought tolerant”) because it is not a desert native plant. 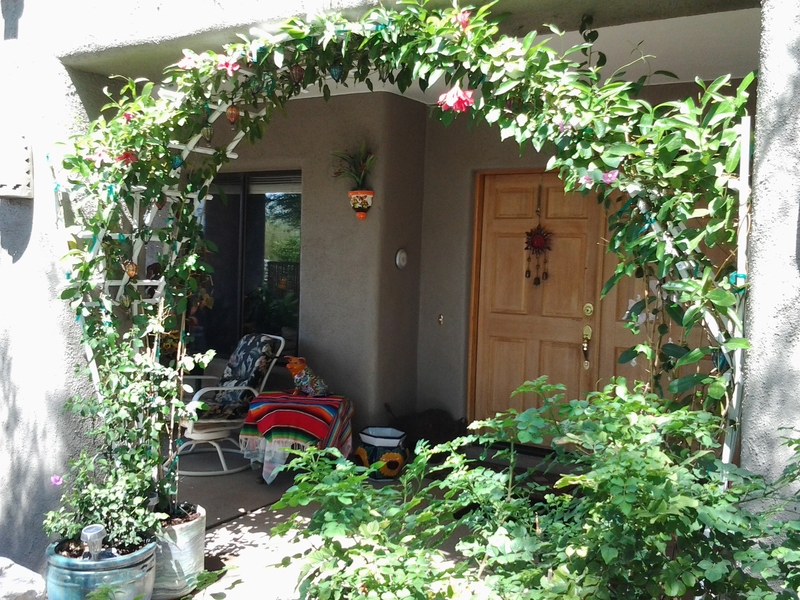 Caring for and growing a Bougainvillea takes more effort but it is worth it! Bougainvilleas flourish in pots and containers. To grow this striking ornamental vine choose a very sunny place. Be sure your pots have holes in the bottom; adequate drainage is a must! Bougainvillea growing tip: Fertilize with Hibiscus Food. Hibiscus food has more potash than many other fertilizers. Be sure to measure exactly the amount of food according to the size of your pot. The amount of watering for your Bougainvillea is directly related to your area and the local weather. 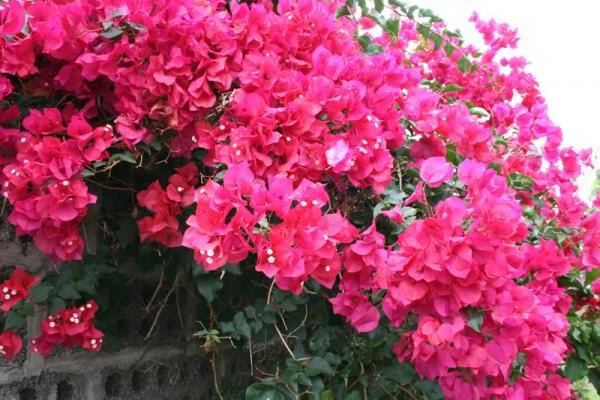 There are some basics —- Bougainvillea is a drought resistant plant, and requires very little water once established. Be sure to let the soil dry between waterings; if your Bougainvillea’s roots stay continuously wet it will promote a weak and shallow root system. Wilting is the best indicator that watering is needed. Don’t let it dry out completely as this will cause bracts and foliage to drop. When choosing an area to plant your bougainvillea, remember that higher ground is best – as this makes water drain AWAY from the roots. Avoid overwatering. In Florida, landscape professionals commonly perform a hard cut at the first sign of summer, and keep on a regular trimming schedule all summer long to maintain size of the Bougainvillea. Pinching is the method of removing the soft tips of young plant stems to encourage fuller growth. Bougainvilleas will send out several new stems just below the pinched tip. Why doesn’t my bougainvillea bloom? Bougainvilleas like their roots to be crowded in a pot. If planted in the ground, the Bougainvillea may not bloom as much. If you want more color in your garden, grow your Bougainvillea in containers! Its vivid color is formed in the three bracts that surround the little white flower. Bougainvillea does well growing on a trellis. 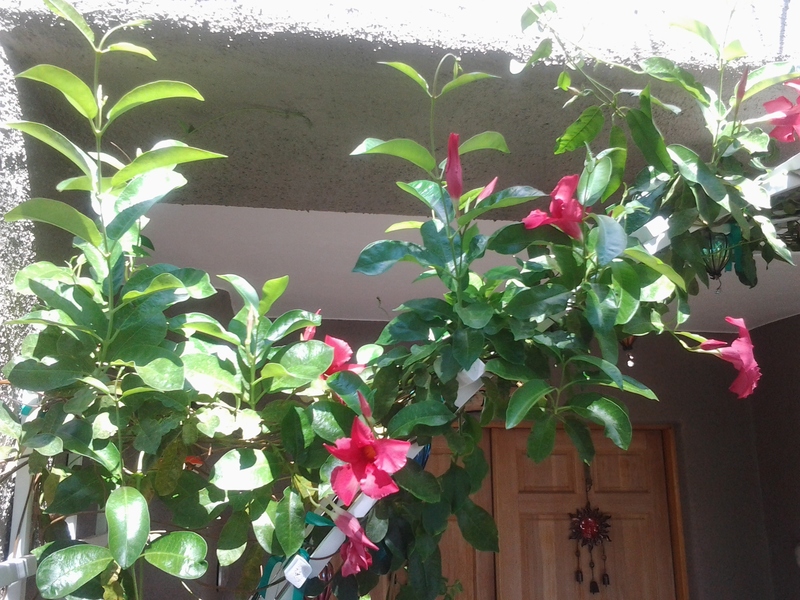 The 2 vines in the picture are a Bougainvillea vine in a pot next to the Mandevilla Vine growing in another container. I trained both vines to continue growing up the trellis. The pictures of these plants growing on our front porch gives you and idea of how happy the Mandevilla Plant is in the large container and how well the Bougainvillea Bush does in a pot. To grow your flowering Bougainvillea shrub/vine choose a very sunny place. Be sure your pots have good holes in the bottom, so you will have good drainage. Fertilize with Hibiscus food as it has more potash than many other fertilizers. Be sure to measure exactly the amount of food according to the size of your pot. Bougainvillea comes from a hot humid climate, and they love the heat! Be sure the dirt in the pot feels dry before you water your bougainvillea. Water large pots until water runs out the drainage holes in the bottom. There are exceptions to watering and caring for your Bougainvillea. 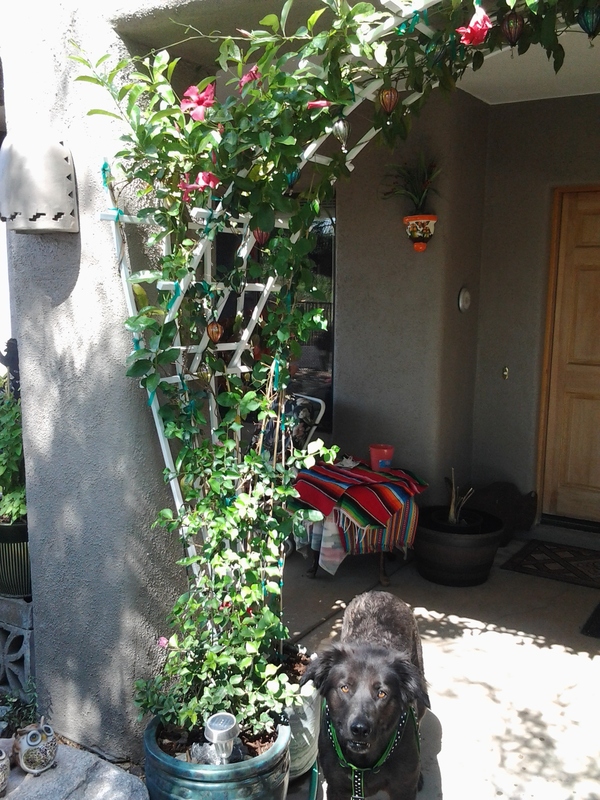 Here in the southern Arizona desert we have had some temperatures above 110 degrees F. When I saw any of our plants wilting, including the Bougainvillea plant and Mandevilla vine I watered them. Being very careful not to get water on the leaves so they do not get burned from the Sun! The Bougainvillea is climbing up the bamboo sticks to the trellis and combining with the Mandevilla vine. If you want your Bougainvillea to grow up and not out you must trim/prune the stems that grow outwards. Keep them short around the bottom. I found that the plants we cut back are growing straight up the bamboo garden stakes, look at the picture of our bougainvillea. The Bougainvilleas I do not prune, have many leaves but fewer blooms, color. 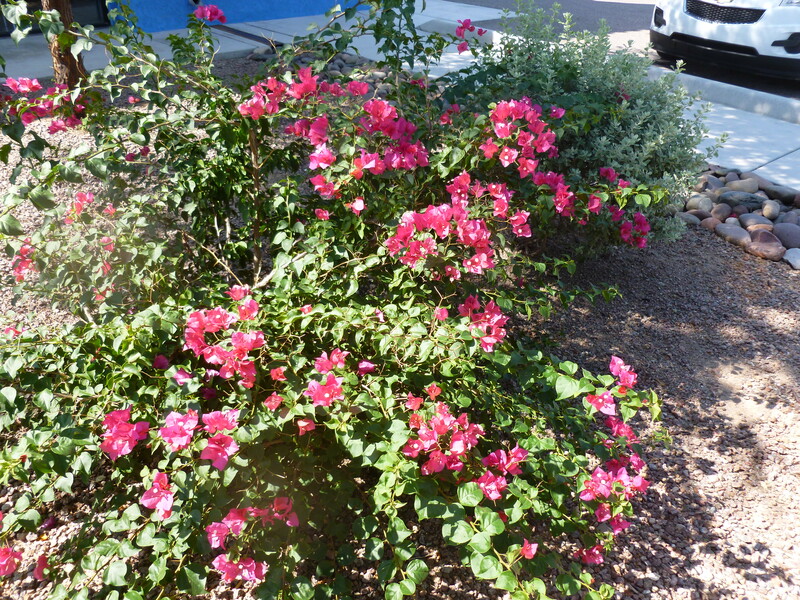 During this winter, both the Mandevilla bush/vine and the drought tolerant shrub, Bougainvillea, did ok. The winter temperatures dropped to the mid 30’s. I removed all the dead leaves. 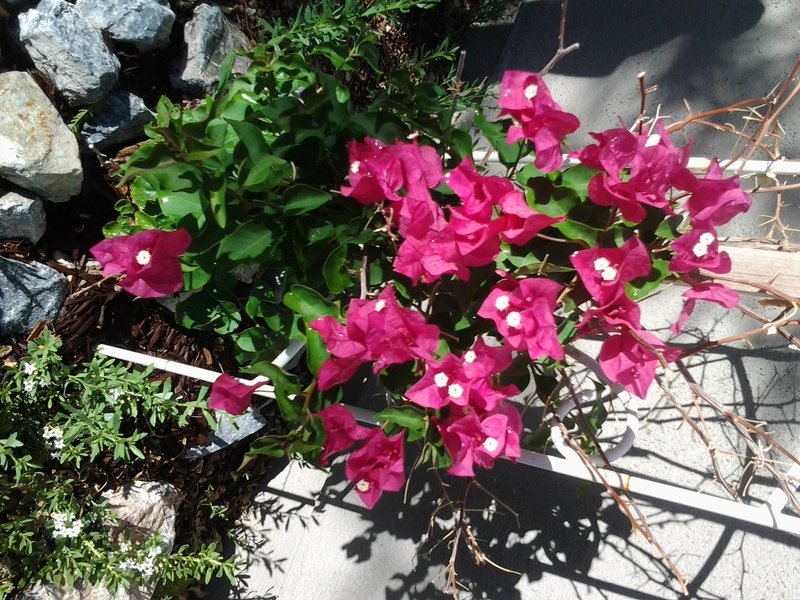 Bougainvillea is drought resistant, I do not call it drought tolerant because it is not a desert native plant. Bougainvillea are native to South America. This flowering bush or is heat resistant to the extreme. 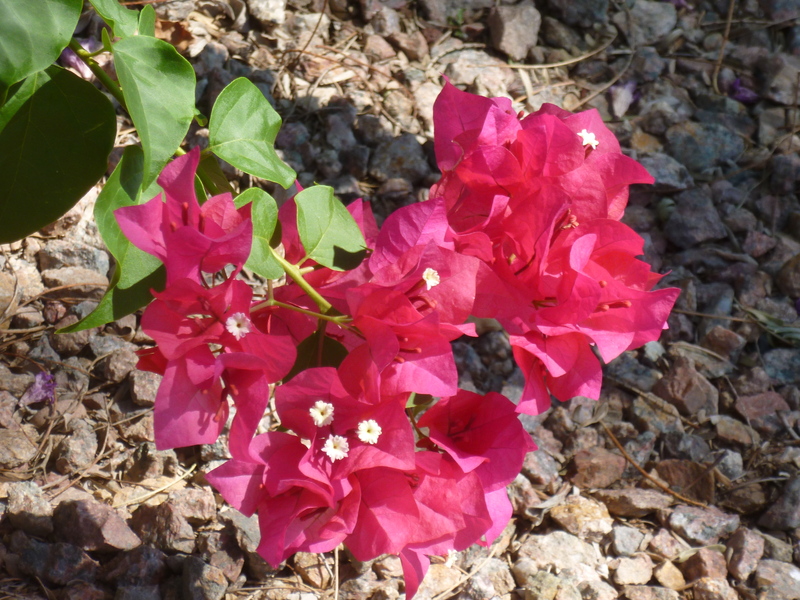 Probably the best heat resistant desert plant is the Bougainvillea. 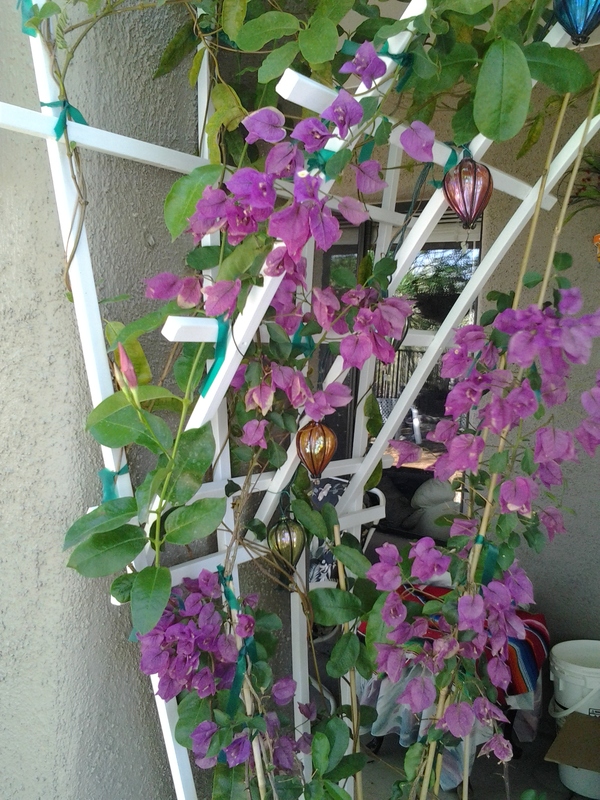 Caring for and growing a Bougainvillea takes more effort but it is worth it. Note how short I prune the bottom branches of the Bougainvillea in the front pot. Growing a Mandevilla – traditionally it is called a Dipladenia, but they are different in how they grow and look. For basic purposes they are vines with the Dipladenia growing better as a shrub or bush and being planted in a container or does well as a hanging plant. The Mandevilla is a climbing vine and does well twining and growing on a trellis. Our Mandevilla Vine prefers part shade. It receives bright light but is also partially protected from rain and the Arizona Monsoon season. It is NOT drought tolerant or drought resistant. But the Mandevilla plant is HEAT RESISTANT. Our Mandevilla is doing incredible and growing well in the pot. Please see the attached photos. 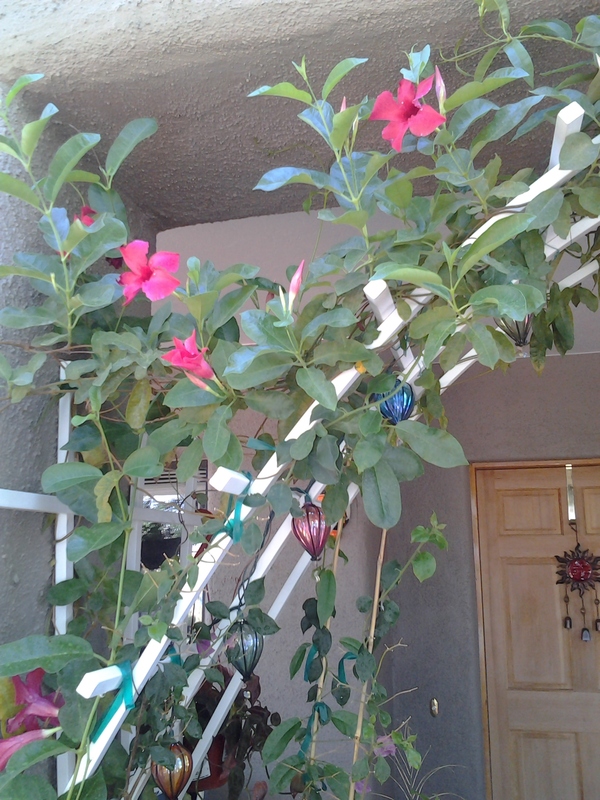 In this picture is a Mandevilla Vine growing on a trellis. It has bloomed continually most of the year. As far as pruning the Mandevilla Plant. I remove the Mandevilla yellow leaves, and trim a few branches that may have died but that is about it. 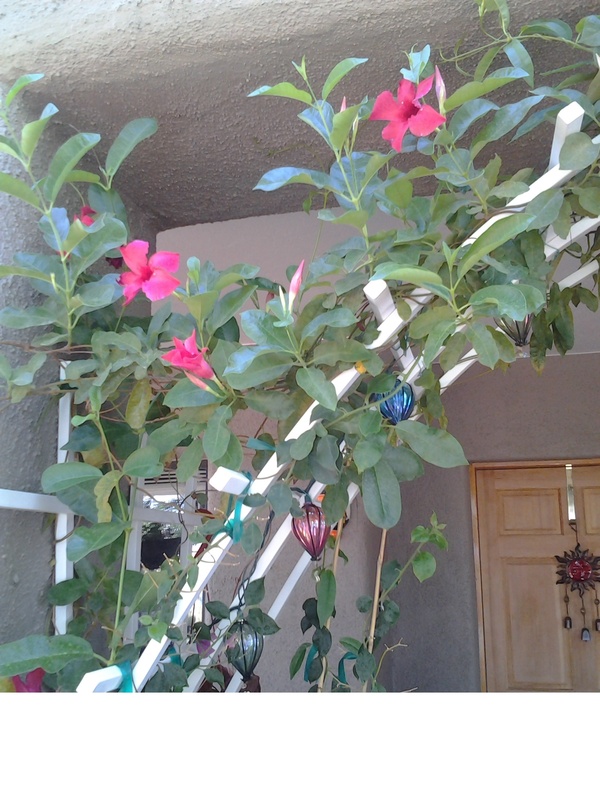 This Mandevilla vine, bush, plant takes very little pruning. Although it is NOT drought tolerant, it doesn’t seem to have any problems with the desert heat as long as I water it every day. If your Mandevilla vine/bush can be planted in part shade… I would recommend this tropical flowering bush for any garden, from planting in Florida to growing in Texas, Arizona and California. 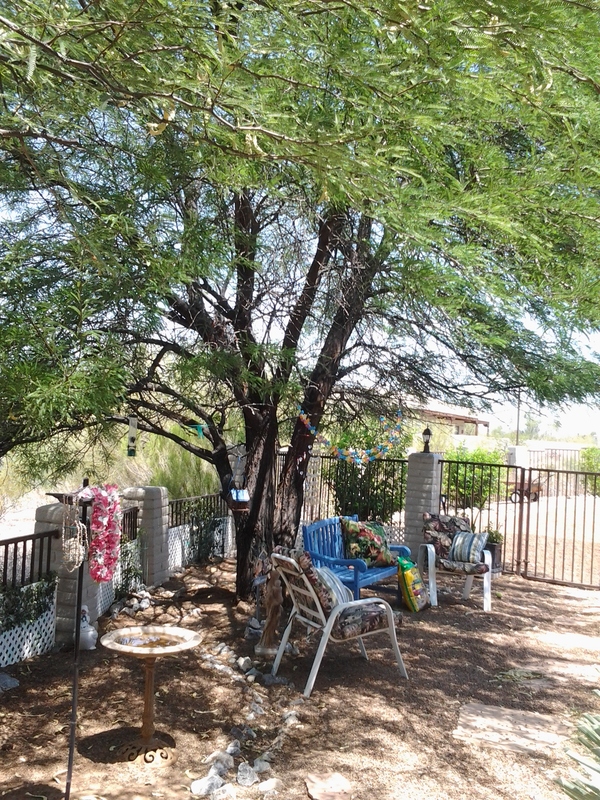 Our Chilean Mesquite Tree provides shade for the mandevilla. Mandevilla is a genus of plants belonging to the Dogbane (attributed to its toxicity) family. Native to South America. It has about 100 species, mostly tropical and subtropical flowering vines (any plant with a growth habit of climbing, stems or runners). The Mandevilla flowers come in a variety of colors, including white, pink, yellow, and red. The Hummingbirds and butterflies visit our Mandevilla often. It is a pollen yielding plant that is fast growing and high flowering. In conclusion, Mandevilla is easy to care for as long as it gets watered regularly, has a trellis to climb on, is in part shade and protected from winds and rain.